You may have already seen the Morclean bear! Here is a little drawing of him. Maybe YOU could doodle your way to having one of your very own! Email in you reason why you deserve a bear! Tell us a sentence or two, or send us in a drawing or some other creative artefact made by you or your friends or family. It's easy! 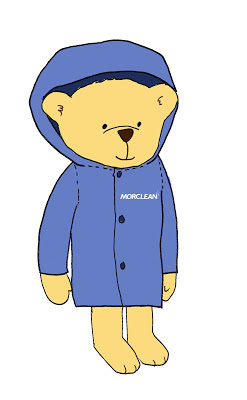 It will make you feel good AND you get a super cute Morclean bear to show for it! Just in time for Christmas. Send in your pictures as well, we will add them to our ever expanding photo album.